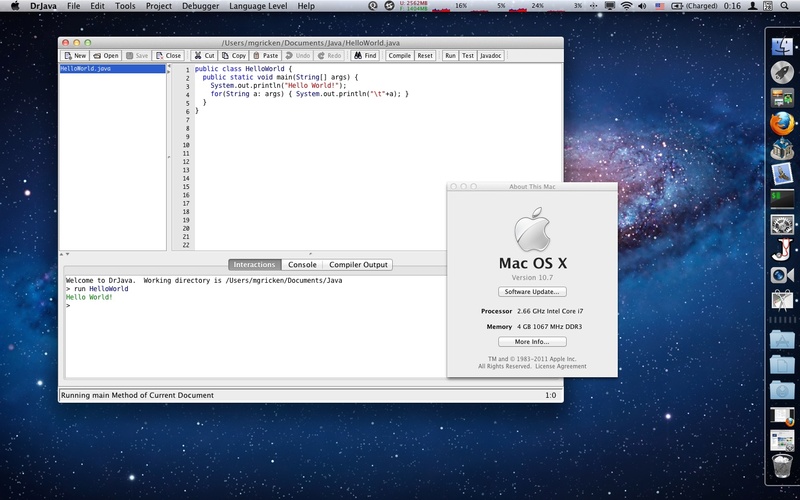 I just upgraded to Mac OS X 10.7, and DrJava works flawlessly. The one vague report that someone had filed therefore proved to be wrong. downloaded and installed, and after that, DrJava opened. What are the exact things you did when you first used DrJava? My DrJava merely shows the logo then nothing happens when I open it even after downloading Java. I had just installed Mac OS X 10.7 Lion. When I clicked on the DrJava icon, my MacBook Pro asked me to download Java. After doing that and installing it, DrJava worked. Could you please send an email to drjava at rice dot edu (change at to @ and dot to .) with as much system information as you can provide? That way, other developers of DrJava can try to help you too.